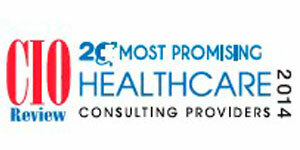 In this edition of CIO Review, we bring to you “20 Most Promising Healthcare Consulting Providers 2014”, featuring the best solution and consulting providers offering consultancy services related to Healthcare. The companies listed here showcases extensive business knowledge and innovative strategies combined with talent base across locations. AaNeel Infotech Provides revolutionary managed care delivery software solution to health care systems. AEGIS.net Premier provider of Information Technology consulting services. Evariant Evariant combines digital marketing solutions, big data and analytics into a unified platform to identify opportunities, measure campaigns and improve patient and physicians engagement. Glenridge Healthcare Solutions A boutique consulting firm to regional healthplans and health systems. HealthCare Information Management Increases the efficiency of healthcare payer claims operations through automated software solutions and professional consulting services. Leidos Health Helps clients to effectively use IT services and solutions to improve the management and delivery of healthcare records and services. Optimity Advisors Advisory services firm that brings industry leaders and client stakeholders together to collaboratively create innovative solutions and deliver results for rapidly changing markets. Qualis Health A population health management organization that improves care delivery and patient outcomes to advance the quality, efficiency, and value of healthcare. Recon Strategy Healthcare strategy consulting firm spin-off from the Boston Consulting Group. TrainingWheel Offering IT training and support to optimize clinical workflows. Wipro Healthcare & Life Sciences Provider of digital patient support, remote patient monitoring, Medicare advantage platform on cloud.